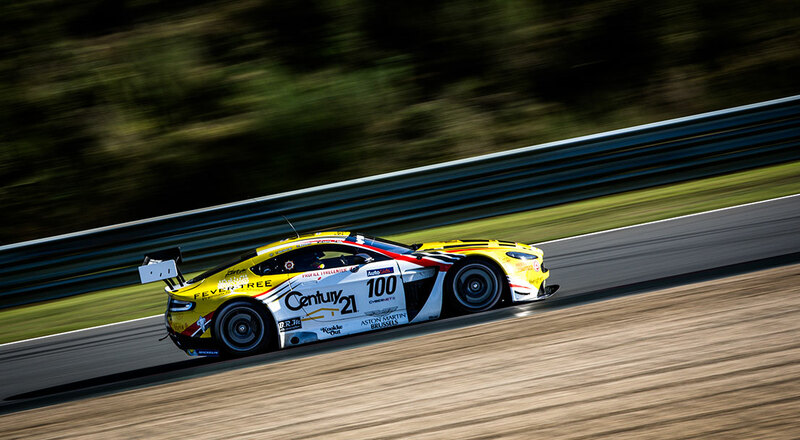 Aston Martin Brussels became the 2014 Belgian GT Championship winners at a gripping series finale at Zolder, where the #100 V12 Vantage GT3 - driven by Tim Verbergt, Bert Redant and Enzo Ide - took the race win to secure the championship title. Proving the V12 Vantage GT3s reliability and consistency across the season, which included numerous wins and podiums, both of the team’s entries went into the final round in contention for the overall championship win. In a strategic move, the team decided to play the race differently for each of its cars to improve its chance of one of them taking the race win. The #100 strategy worked well and, by the final laps of the three-hour long race, Ide was locked in a fierce battle for the race win with the Audi, knowing that whoever crossed the line first would take the National title. With the pressure high, the pit-crew watched on anxiously and gasped as the two race leaders made contact, took a spin and landed in the gravel. Unbelievably, both cars were able to emerge safely and continue racing with the yellow Aston Martin V12 Vantage taking the win. Luck, however, was not on the side of the #9 V12 Vantage GT3, which had some issues and was forced to retire from the race. “It’s actually a pity because, otherwise, both cars might have been able to determine among themselves who could win the championship. Well, that’s racing and I am very happy with the title. This was not really a race, but a film with an unlikely scenario. Luckily for us, there was a happy ending!